Better than expected, this is the movie about an unsuspecting guy who gets changed into Santa Clause, and watching that process turns out to be a lot of fun. The Santa Claus is a holiday movie about Santa, the North Pole, and believing in Christmas. Like Elf or the Polar Express, this is a movie that goes right after the true icons of Christmas, as opposed to movies like A Christmas Story or Christmas Vacation that just tell a story about a family during that time of year. This one is actually about a character who unwillingly becomes Santa, himself. 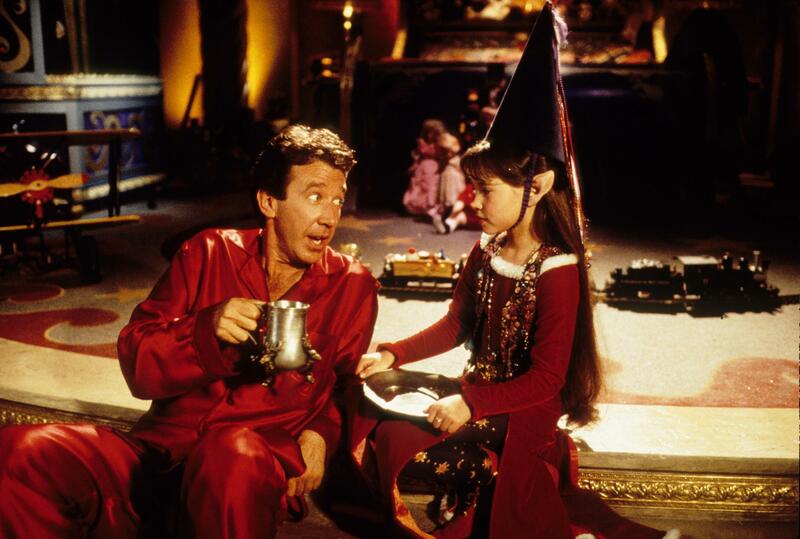 That’s a pretty intriguing premise, and with Tim Allen playing the lead, (when the actor was at the height of his career, at a time when his network TV show Home Improvement was at a ratings high,) this movie seemed like a surefire recipe for success. And it was. The movie became an instant holiday classic and spawned sequels. For kids, the movie definitely works. The humor is about on that level, where kids can enjoy it again and again. For adults, however, it doesn’t quite match up to some of the better Christmas comedies (Scrooged, Love Actually, Elf.) That’a because what we’ve got here is a great premise that doesn’t go a whole lot further than that. At the very most, two of the three acts are good, but in the final one, the movie sure does lose it’s momentum. The idea here is that Tim Allen is a regular guy. He’s a divorced businessman. We never get too much involved with what exactly that business is. I suppose it’s toy marketing, based on one pitch meeting scene, where another marketing man tries to sell the idea o a toy with Santa in a tank. But this scene has nothing on the pitch meeting of Big, (another toy marketing pitch,) or even Elf (a children’s book story pitch.) Instead, the Tim Allen character, Scott Calvin, and the business he is in are almost an afterthought in this movie. When we meet Scott for the first time, he is being honored during a speech at the office Christmas party, for how much business he brought in over the past year. The movie is treating this party more like an honors dinner than a Christmas party, but that’s okay. It’s an obvious trick to tell us a little bit about the character as quickly as possible. Similarly, as Scott tries home and calls his ex-wife, Laura, from the car phone, making up excuses about why he will be late, we are meant to think he’s not such a great guy, because of the lying. But then you realize, he was just at the office Christmas party, and not doing anything nefarious. His lie isn’t about where he was, but just about why he will be so late to pick up his son. Once he gets to the house, there is a discussion between Scott, Laura, and Neil (her new husband,) about whether or not their son, Charlie, should still believe in Santa. Neil says no. Scott says yes. Laura is somewhere in between. Scott takes Charlie for the night, and they end up at a lousy diner on Christmas Eve, after Scott burns the turkey at home. That night, they hear noises on the roof in the middle of the night and Scott goes outside to catch Santa up there. When he catches Santa off guard, it causes the old man to lose his balance and fall off the roof. The next thing Scott knows, Santa isn’t there anymore, but his clothes and reindeer are. And so is a card that explains what Scott needs to do. Put the clothes on. No sooner does he do this, than does he start transforming into Santa, himself. All of this, so far, is pretty good. Now comes the silly stuff. The bag full of gifts acts like a magic balloon and lifts Scott into the air when he holds onto it. The bag carries him up to rooftops and flies him over chimneys before dropping him down. And then it gets worse. When Scott finds himself on the roof of a house that has no chimney or fireplace, he is dropped over a very thin pipe, and his body transforms and to be able to fit and squeeze down the pipe. This just look ridiculous. Fun for kids, but certainly not for adults. Following this night of Christmas Eve, Scott and Charlie are taken off to the North Pole. There they meet a bunch of elves, including some memorable ones like Bernard (played by David Krumoltz,) and are given directions for when to return the following year. And then Scott wakes up in his own bed, wearing the Santa Pajamas, (with a big S.C. on them for both Scott Calvin and Santa Clause.) His ex-wife shows up to get Charlie and the boy tells all kinds of stories about how last night Scott became Santa and the two of them traveled to the North Pole together. So ends the first act of the movie. The second act is all about the next year. It’s about Scott gaining a crazy amount of weight and not being able to shave his beard off. This part of the movie should have gotten more time. In most films, the second act is the longest In this movie, it’s the shortest. Scott visits a doctor, he shows up in bad shape to that office meeting where someone is pitching a product, and there’s a soccer game scene, where he goes to watch his son play and is met with a bunch of kids who line up to sit on Santa’s lap. These scenes are great, but we could have sure used some more of them. How about scenes of Scott not being able to fit places that he usually could, and not realizing it, since his body basically changed overnight. Things like that. And then we are in the final act, and it’s about that Christmas Eve, one year later from the first one. Boy does a year seem to go by fast. This time, Scott and his son are not able to see each other so easily. His wife has filed for sole custody and has won the case. So what does Scott do? He kidnaps his son. This is where the movie goes too far. And when the police go after Santa and arrest him, an emergency elf squad, resembling a flying SWAT team shows up. This is all cute, but it’s just a little too silly. And the kidnapping element is too drastic and extreme. How is the mother supposed to get over the fact that her son has just been kidnapped? 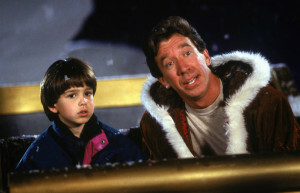 The Santa Clause is not a bad movie. It isn’t nearly as good as some of the other holiday classics like Elf (a new classic,) or a Christmas Story, (an older classic.) That’s because those other movies work on multiple levels, whereas this one really works on only one. The story of a man being transformed into Santa against his will. Other than that, the movie is kind of simple minded. It’s got three acts, and the first and third are on Christmas Eves, one full year apart. The second act is about that year in between them, and yet somehow the second act ends up being the shortest of all three. So the two acts that are each supposed to be only one night are the longer ones. It doesn’t feel right. The movie should have found more to do in it’s second act. But despite this, the first and second acts are both pretty good, and it is only the third act where the movie truly falls short of its mark. Two out of three is not bad, and neither is this movie.